I'm hoping to capture in this web-based journal many of the cultural events that I enjoy. Tonight we had hoped to make it to the art museum to see the 1957 Jayne Mansfield and Tony Randall film Will Success Spoil Rock Hunter? but were in Chapel Hill visiting with friends and their family who lost their 85-year-old father to burns resulting in a housefire. Tragic. Tomorrow we will attend the funeral. 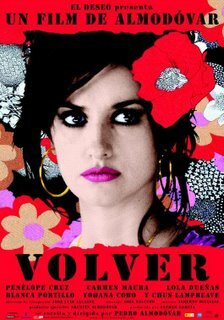 We did go to see Volver, the first Almodóvar as well as Penélope Cruz film that I have seen. This was one of the first films that I have seen with my wife that she liked significantly more than I did. It was an interesting film about possible life after death, Spanish village superstitions, and poorly behaved husbands, but I just must not get it and certainly don't see why it received a nomination (for Cruz as leading actress) for an Oscar. You can see its trailer below. Das Leben der Anderen. I also hope that Forest Whitaker wins best leading actor (as Idi Amin) in The Last King of Scotland - what amazing acting.